Cary, North Carolina: Ballet West II, an elite touring ensemble based in Salt Lake City, Utah, will perform at Cary Academy on Saturday, May 18 at 7pm. The troupe will perform a mixed bill of time-honored classical routines and bold new works that will showcase their impressive and diverse talents. The repertoire includes Elena Kunikova’s Divertimento, excerpts from Don Quixote and Swan Lake, Ballet West Principal Artist Emily Adam’s Laden, and a new work by Ballet West Demi-Soloist Trevor Naumann. 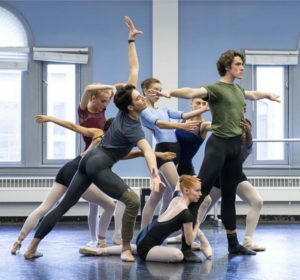 International Ballet Academy in Cary is presenting the Ballet West II troupe, which includes two alumni of the IBA Pre-Professional Program: Nikki Fannéy and Cy Doherty. IBA Alumni Chandler Proctor (Demi-Soloist with Tulsa Ballet), Anissa Bailis (Company Dancer, Ballet Idaho), and Peyton Anderson (Washington Ballet Studio Company) will also perform in the program. A select group of current IBA Pre-Pro students will also perform, including Parker Garrison (Finalist, Prix de Lausanne 2019) and Catherine Rowland (Youth Grand Prix Award winner, Youth America Grand Prix 2019, Winston-Salem, NC Semi-Final). Tickets for the performance are $25 and go on sale March 16th at 9am. Order online: http://tututix.com/balletwest.